Warm Winter Wishes. That is what I wish for everyone, especially those affected by Hurricane Sandy. I spent almost a week in Queens NY with NC Baptist Men and Women Disaster Relief preparing approximately 10,000 warm meals a day. Such a humbling and very rewarding experience. If you are interested in finding out more about what NCBM Disaster Relief does, please go to their website. There are so many ways we can all help. Now on to some creativity. I loved this week's sketch! A simple but elegant layout that could be used for any occasion. I am inviting each one of you (yes, you ) to try out this sketch and participate on the challenge blog. Step out of your comfort zone. Remember, it is only paper and it does not have to be perfect :) I have created so many cards that I thought were just so-so and then someone comments that they really liked it. Or it may start someone elses creative juices flowing as we try to do when the design team posts their creations. I am so looking forward to see what you come up with! I used the Winter Wonderland stampset and Snow Festival Designer Paper by Stampin' Up! for this card. The sentiment is from Winter Memories. All of these products can be found on my website in the Holiday Catalog. These sets are particulariy wonderful for those that like to color. Or, stamp the images in color and create a monotone card. Have fun and I will see you soon! Is anyone else getting hungry for all the great treats we have during this time of year? I love to cook for other people and this is the perfect opportunity to go all out. Kind of like having a potluck except I get to make all the food and my excuse is that we HAVE to have this much variety for the holidays. So my card for the SQSC Design Team has a baking theme. Enjoy and I hope you will be inspired to join in and make your own Holiday card for us to see. The sketch challenge is fun and sure to spark some creative ideas. Click HERE to go to the Stampin' Queen Sketch Challenge Blog. Cristena from Stampin' Queens Sketch Challenge has come up with another great challenge. (where does this girl get all these good ideas?!) I have felt inspired by the other design team members to get myself out of my designing box and use some paper that I had not really known what to do with. I love everyone else's use...I just couldn't come up with my own. Cristena's sketch pulled it all together for me. Take a look at the Stampin' Up! designer paper "Beau Chateau". Some of these sheets are perfect for scrapbooking but how do you use the large frame image in a card? Remember, we are looking "outside of the the box" ;) I even used the sentiment from one of the sheets. The stamped image from Welcome Christmas is heat embossed in Stampin' Up! 's Pewter found on page 31 in the new Holiday Mini Catalog released September 1st. You can view and order from the Holiday Mini by clicking HERE. Now onto to the sketch. Let's see what you come up with and make sure to link your creation to Stampin' Queens Sketch Challenge Blog before Tuesday. Try a new paper or stampset. Not feeling the ideas coming on? I know you will be inspired by the great group of Stampin' Queen designers. I am officially brain dead. (but some of you knew that already;) I have been designing Holiday Cards for the past two days using Stampin' Up! 's Simply Scrappin' kit "Christmas Jingle". So far, I have 45 cards and still have supplies left over. I will be teaching a class with this kit very soon. Interested? Send me an email and I will keep you posted. 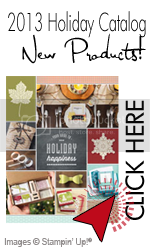 Tags: Card Classes, Christmas Jingle, Holiday Cards, Simply Scrappin' Kit, Stamp Classes, Stampin' Up!